A kitchen utensil that is a shorter form of the whisk that is used for whipping a variety of food ingredients. It is commonly available in sizes ranging from 6 to 14 inches in length. The head is round in shape and consists of coils wound around a circular metal wire that is hinged to the handle. This hinge allows the head of the whisk to bend and conform to the shape of the container holding the foods to be whipped. 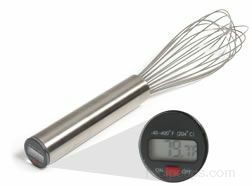 The coil whisk can be used to whip foods being prepared, such as eggs, sauces, gravies, seasonings or oils, and other similar ingredients. Also known as sauce, spiral or delbor whisk.